Alice was getting very tired sitting looking out of the tall windows watching the rain drip dropping on the window pane, the slow ticking of the old grandfather clock in the corner adding to the endless monotony. She idly traced the path of one such drip as it travelled on its way. "Why does it always rain on days that end in day?" thought Alice, which rather surprised her as days were always days and a day was a day like any other day. All this rather confused Alice which was also surprising for a lady a little short of half a century who really should know better than to have such fanciful thoughts. Placed carefully in the window bottom was a small rectangular parcel, quite scruffily wrapped in brown paper with a disused orange marmalade label sealing the folds. On the front it was addressed quite simply to 'ALICE' followed by a thumb print of the finest jam. Alice knew it was jam as it still had a few pips attached. It had arrived unexpectedly in an unexpected way as unexpected things do that very morning when a tiny knock on the door disturbed Alice from reading her book. It lay on the doorstep with not a soul in view. "Well!" thought Alice to herself. "How rude! They could of at least have said hello!". It was placed in the window bottom for later, Alice didn't have many surprises and wanted this one to last a while longer. 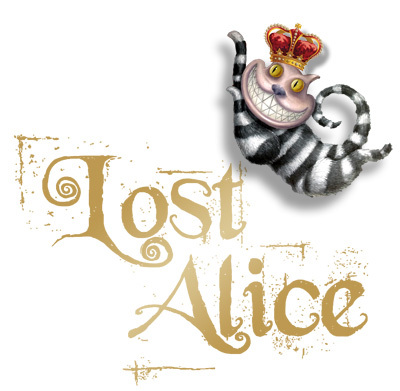 You may remember Alice from her adventures many years ago, you may have even read about them; Alice however refused to believe that she had been on adventures, she even refused to believe in Hatters and Caterpillars and Queens Of Hearts nor Gryphons or Cats from Cheshire and far. As for Wonderland she spoke no more, in fact the whole imagined episode was becoming a farcical bore. No, this Alice had lost something. A special something that even Alice wasn't aware she had lost in the first place. Imagine if you will a place where lost things go, I'm not talking about a sock or a glove or an umbrella but more of a place that things go when they are lost forever. A world that contains every feeling, every creation, taken from thoughts conjured up by the imagination. Only few can return but most would if they could, to find what they have lost which some thought had gone for good. That place is called Wonderland and we all know it's there, all you need is a key, the door is everywhere. Alice tired of looking out of the window picked up the box and removed the label, as she lifted the lid the the loudest ALICE! shouted out from the box startling her (for Alice wasn't used to strange boxes shouting) "Oh my! What on earth was that?" exclaimed Alice quite taken aback. "It's me!" came a tiny voice from the box. Alice looked inside and saw nothing apart from a small rusty key. "Who is me?" said Alice, "Is me you or you me?". There was no reply, Alice tipped the key out of the box into her hand. "Ouch! Be careful young lady!" came the small voice. "You, you can talk?" replied Alice "I have never heard a key talk before!". "Have you ever asked a key if it could talk before?" said the key rather haughtily , "No, I don't believe I have." said Alice not quite sure which bit of the key to talk to. "Then you are a very poor authority on keys." the key replied in a tinny tiny voice. "I am here to help you, but first you must find the door." "Pick me up Alice, I have a message for you' the teeny tiny voice replied. Alice picked up the key and examined it closely, underneath all the rust Alice could see a small amount of lettering. "Go on, clean me." suggested the key. Alice rubbed away the rust being very careful not to tickle or annoy the key until she could read it. "Sometimes the last place you look is the first place you find it"
Alice pondered the sentence for a while, "It sounds like nonsense to me, last and first? Why if last is first then first is last." and with that Alice dismissed the idea as a lady should. "Nonsense? It's not nonsense my dear Alice it's all sense!" shouted the key "Where is the last place you would look if you had lost something?" Alice frowned, "But if I knew the last place to look then I would know I haven't anywhere left to look." "Precisely!" said the key "If you haven't anywhere left to look then you must have found it!" "Found what Mr Key, if I may be so bold to call you that." said Alice still confused over what she had found, lost or indeed why she was making conversation with a key. "This!" shouted the key as it rose from Alice's hand, drifted towards the old grandfather clock and squeezed into the keyhole, almost a perfect fit. "Well that's the last place I would look to find something I had lost." she replied, slightly irritated at the keys stupidity. "Who on earth would lose something in a clock?" "Have a look Alice, see what's inside..." beckoned the key. Alice reached out and turned the key. Of course nothing happened, no, something did then happen. "The hands of the clock are going backwards" exclaimed Alice "and I'm getting smaller!" she shrieked. As the hands wound round and round Alice started to change; first of all she got smaller and smaller, her wrinkles started to disappear and her hair went from grey and dull back to the golden flowing locks of her childhood, indeed it had seemed her lifetime was passing with each tick-tock of the clock until once again she stood the height of a child dressed in her favourite Sunday best. The clock too had started to change, no longer did it resemble the boring brown tick-tockery timepiece it once was, now it was bright pink with two large protruding ears sticking out of the top. Alice stood quite still unable to take it all in, as she looked at her wrinkle free hands, once again small and slender as a child. There was a click and the front of the clock swung open. "Curiouser and curiouser!" said Alice "I can't help feeling I have said that before." she added "How curious." "Oh dear, oh dear!" came a voice from inside the clock, a voice that Alice knew, but that was Impossible for Alice knew it not to be true. "I shall be too late!" added the voice. "No, It can't be can it? The white rabbit?" said Alice out loud, "No, it was just a childish dream, a fanciful make believe story from an over imaginative girl." she added "I shall prove it, I shall call out his name and when he doesn't answer then I will know that I am right."